Add to this Page to your Favorites! Click here for rules, guidelines, scoring schedule, and angler scoresheet. VBAC Fishing Roulette - Fish selected! At the March 7th meeting, 34 participants signed up for the 2019 Fishing Roulette. The VBAC Fishing Roulette is much like a calcutta (a side wager) paid by angler’s club members to compete for a little cash. 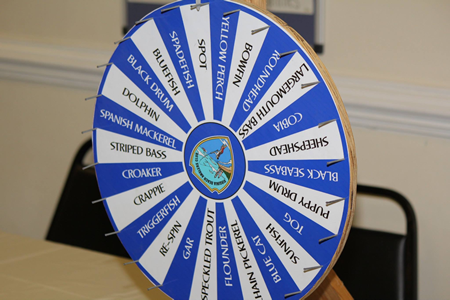 Five fish were selected by the spin of the fish roulette wheel: Spadefish, Bluefish, Bowfin, Flounder and Yellow Perch. The heaviest fish of these five species selected will win about $136 each for 2019. The roulette winner is only eligible for those who signed up and paid before the wheel was spun at the March meeting. As of the March 7th meeting, None of these fish have been submitted to the club. 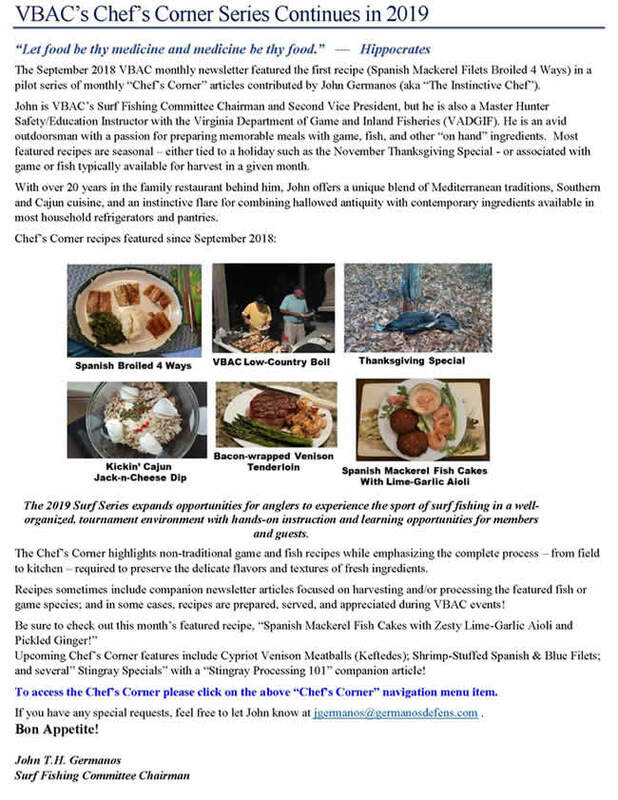 Any fish caught from 1/1/2019 – 12/31/2019 will qualify. Only the heaviest fish in each category will win. Must have paid by March 7th meeting. You are required to submit your entry via the clubs standard Prize Fish form. Prize Fish/Roulette entries can be submitted in hand or by mail to the Virginia Beach Angler's Club Prize Fish Committee. Anglers are expected to have a picture of the fish; it will also qualify you for the recently revamped club fishing photo contest. A table of the current leaders will be kept up to date and posted in each newsletter. For any questions or concerns regarding the Roulette or Prize Fish contest, please see Kelly Hoggard at one of the meetings. At the 7 March 2019 General Membership meeting, we drew for the eight Fall 2019 Fall Surf Fishing Teams. These results are posted in “Tournaments” section of our website. Results will also be posted in the April edition of VBAC’s Tight Lines newsletter. Congratulations to all and stay tuned for further information on Club-level Tournament Team Meetings. 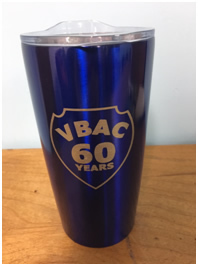 At the recent Awards Banquet held on February 16th, all attendees were treated to a Virginia Beach Angler’s Club 60th Anniversary commemorative mug. Additional mugs are available to club members. If you were unable to attend the dinner (you missed a good one) those members may pick up their mug from Patty Searby only at the March General Membership meeting. Thereafter, the mugs will be on sale for $15.00 beginning at the April meeting (anyone who received a mug at the banquet and wishes to purchase additional mugs, please see Patty). The positions for the two spring 2019 Ocracoke Invitational Surf Fishing Tournament teams were drawn at the February business meeting, and a Club-level planning meeting was held on Tue, 19 February. 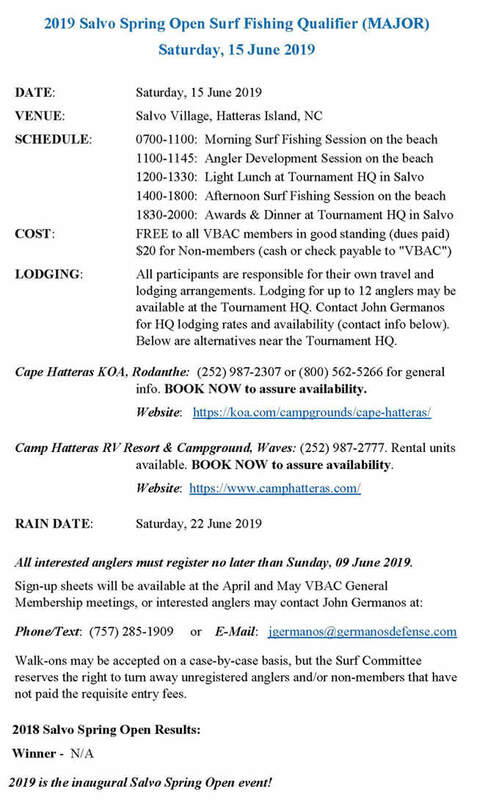 In addition, VBAC will enter two teams each (8 total) in the following Fall 2019 Surf Fishing tournaments: Hatteras Village Invitational Surf Tournament; Long Beach Island World Series of Surf Fishing; Nags Head Invitational; and Cape Hatteras Angler’s Club Invitational. Team Positions and Alternate lists for each team will be selected by four separate drawings at the March 7, 2019 business meeting. 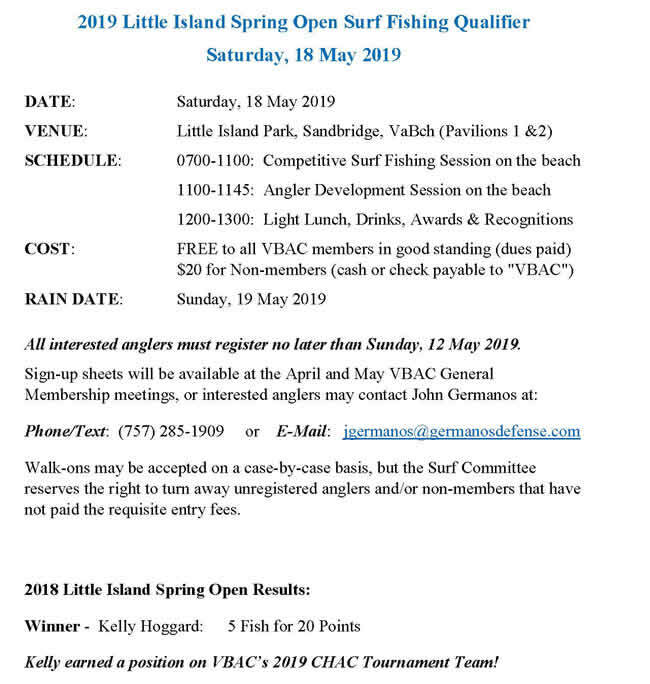 Interested anglers must be a member of VBAC in good standing (dues paid) and have participated in supporting the Club in at least one Club activity in 2018 to be eligible for the drawing and/or secure a position as a returning team member (new members are exempt from the previous year’s activity requirement). A separate angler registration form is required for EACH tournament drawing. Registration forms will be available at the March 7, 2019 meeting. 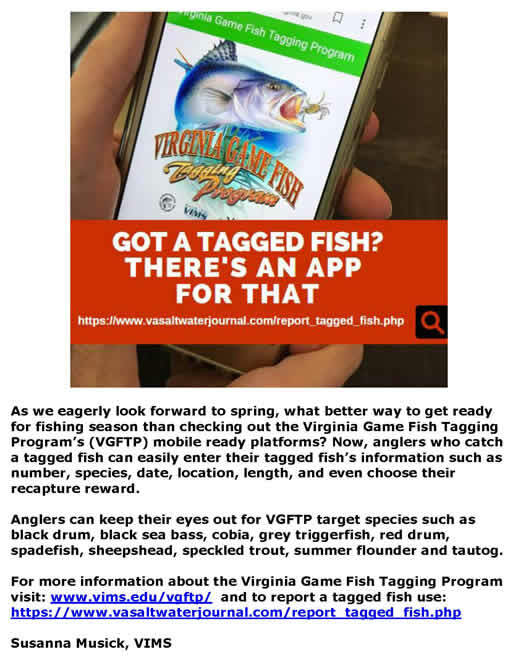 Anglers may also mail completed forms to the addresses below; or, simply fill out the form in the Tight Lines Newsletter and bring it to the meeting. All entry forms MUST be turned in by 7:30 p.m. that night. You do not have to be present to have your name drawn. All selected anglers must have access to surf fishing equipment, make travel arrangements, and meet your share of the team lodging and any additional team expenses. FEES: $60 per tournament that you are a team member of (except Long Beach Island) is due at the April 4, 2019 business meeting, and the balance of lodging for each tournament is due at the May 2, 2019 meeting. The Board of Directors and the Prize Fish Committee have refreshed and updated a photo contest open to all club members. For 2019 and beyond, a $50 cash prize will be awarded to the club member who submits the winning photo. For the club fishing roulette and monthly prize fish submissions, a photo of the angler, with his/her catch, is desired. All other roulette rules remain unchanged. A committee, comprised of Board members, will evaluate all photo submissions and select a winning photo. The Virginia Beach Angler’s Club celebrated their 60th year last Saturday night, February 16, 2019. The primary function of the banquet was to recognized those members who had excelled in salt water and fresh water fishing. In addition, all attendees and guests enjoyed an opportunity to socialize with friends and guests, while enjoying a suburb meal. This year’s attendees were also treated to a commemorative hot/cold drinking cup embossed with a 60th anniversary club seal. The meal preparation was orchestrated by Gerry Mariano and assisted by John Gabriel, John Germanos and Mark Wray. We had the pleasure of various Appetizers, Prime Rib, Seafood Newburg, Rice, Green Beans and Peppers, Roasted Potatoes, Tossed Salad, Rolls and Butter. A multitude of deserts were provided by the club members and Gerry Mariano personally prepared his specialty, Bananas Foster. The meal was excellent. If you missed the banquet you missed a real treat. Chris Schneider, Prize Fish Chairman and George Gabriel, Master of Ceremonies led the recognition of the award winning anglers. Thirty five different species were submitted for consideration. Twenty two anglers were recognized for their Top Salt Water entries (catch or release) and seven anglers were recognized for their Top Fresh Water entries (catch or release). Based on the club minimum size guidelines, two anglers were recognized as Expert Anglers and five members were recognized as Master Anglers. We also recognized the anglers who were the Most Outstanding Salt and Fresh Water fisherman, the Male and Female Catch or Release Anglers of the year and the Male and Female Surf Fishing Anglers of the year. The last two awards presented were the Dr. James C. Wright Conservation Award and the prestigious Member of the Year Award. Delegate Barry Knight was recognized for his work to maintain and improve the quality of the Chesapeake fishery through his efforts in the Virginia Assembly. Finally, we recognized Bryan Watkins as our Member Of The Year. This award recognizes an outstanding VBAC member who has given much time and effort to improving the quality of the VBAC. The evening ended with a Chinese Raffle of over 60 items. Numerous very fine items were won including, many rods and reels, a Pete Federico framed photo, fully equipped tackle boxes, electronics for the boat and home, a Go Pro camera, tackle, lures, and other various items. The table center pieces, designed and made by Maureen Gabriel, were also raffled off. Our teams represented the club very well this year. Overall we finished in the top third in almost all of the tournaments we entered. Listed here are the tournaments, fish scored, points and finishing place. Thanks to all of you who participated on the teams in 2018! 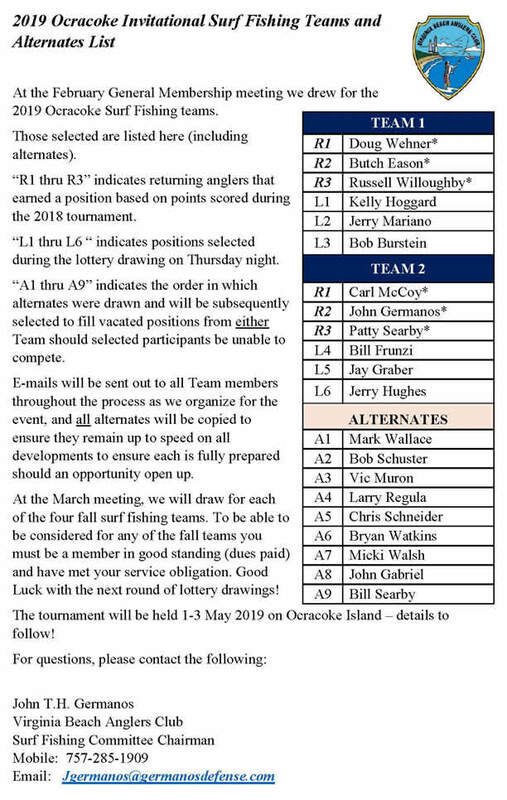 We will be draw the names for the 2019 Ocracoke Team at the February club meeting and the names for the fall tournaments at the March club meeting. The Surf Fishing Committee recommended and the Board of Directors approved allowing the winner of the Spring and Fall Intra-Club surf fishing tournaments a chance to be on a surf fishing team of their choice the following year. They must be in good standing (dues paid) and must have fulfilled the service to the Club requirement. They must declare which tournament team they wish be on prior to the drawing for the Ocracoke Tournament the following year. Make your plans now for these tournaments. We will be drawing the names for the 2019 Ocracoke Team at the February club meeting and the names for the fall tournaments at the March club meeting. Registration forms will be in the news letters and I will have forms at the meetings. Thanks to all of you who participated on the teams in 2018! Our annual December Crappie Tournament was held on Lake Smith. The day dawned with good weather and 17 anglers came out to try their luck. A Big Thank you to Gary Doerhoff and his crew of helpers: Patty Searby, Butch Eason, Ronnie Nixon, Jerry Mariano, & Carl McCoy who got things started and ran everything so smoothly. Most anglers ended up skunked with nary a countable fish except for two boats. Our own Melanie Bayford captained the boat on which John Leay got the third-place fish (1.6#) and won a crappie fishing rod. First and second place went to anglers Josh Morris (First Place with 2.38#) winning the $150.00 prize, and Taylor Estes (Second Place with 1.93#) winning the $75.00 prize. The December Christmas party was busy with elections, friends, conversation, Toys for Tots collection and lots of really good food. Thanks so much to everyone who brought something special. Each of you made all the rest of us both happy and full! We hope everyone had a great Christmas and that the new year is full of blessings for us all. The 2018 Sea Tow sponsored Toys for Tots drive, was amazing! A total of 1826 toys were donated by numerous businesses and all the local area fishing clubs. Through everyone’s efforts, hundreds of children had a brighter Christmas. A big thank you to all volunteers and businesses who took time for this noble cause. If you missed the oyster roast, you missed a really good time with lots of friends, plenty of food (some fattening), great deserts (all certainly very low calorie), and lots of raffle prizes! THANKS to all those that shared their time, cooking talent, oyster assistance, muscle, food, and raffle items! A new venue, centrally located in Virginia Beach was the ticket to a great Oyster Roast. Jerry Mariano and the crew put together a great spread of food including sausages and peppers, hotdogs and hamburgers. Sides and desserts were brought by the members and guests who came out to enjoy the festivities. This was a great opportunity to learn more about the new members in the club. For anyone who missed out, make sure you check your calendar and circle the date for next years event. We will be back at the Brock Center in 2019.